The pilot and crew of a plane which ditched into the Hudson River after its engines failed have been honoured with the keys to New York City. Mayor Michael Bloomberg said the two pilots and three flight attendants of were "five real American heroes". Capt Chesley Sullenberger steered the aircraft into the water as it lost power shortly after take-off, saving the lives of all 155 people on board. He was the last person to leave the plane as it floated on the icy waters. "It's been called a miracle but in this case there is no miracle without the years of experience and training (of the crew)," Mr Bloomberg told a ceremony attended by all five crew members. "Air passengers everywhere were reminded that these true professionals aren't there just to serve drinks and snacks, but they're there to keep us safe." He said the day of the accident "could have been one of our most tragic, but became one of our most triumphant." First Officer Jeffrey Skiles, and flight attendants Doreen Welsh, Sheila Dail and Donna Dent received the symbolic keys with Capt Sullenberger. Capt Sullenberger told reporters that the plane was too low, too slow and too far from any airport to land safely. After intense media focus, particularly in the past week, he said: "It's a life-changing event. My family and I are trying hard to be true to ourselves while still adjusting to this new reality. "I feel a great obligation to my co-workers, to all the aviation professionals in this country and around the world, to be chosen by circumstances to be a temporary spokesperson and to represent them as well as I can." 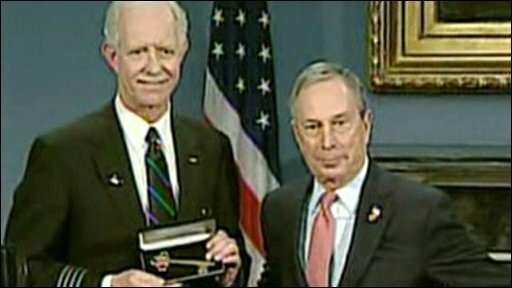 Mr Bloomberg also gave Capt Sullenberger a copy of a library book he had had to leave in the plane. Entitled Just Culture: Balancing Safety and Accountability, by Sidney Dekker, Mr Bloomberg joked that it could have been written by Capt Sullenberger himself. Capt Sullenberger twice checked the plane for any remaining passengers or crew before leaving the slowly sinking wreckage. US authorities confirmed last week that birds collided with both engines of the plane just before it ditched on 16 January. In a tape of the brief communications between the pilot and an air traffic controller, the pilot is heard calmly saying that he is unable to return to the airport. "We're gonna be in the Hudson," Capt Sullenberger says, in the last of his messages, less than three minutes after the bird strike was reported. The plane had only managed to reach an altitude of 3,200ft (975m).